Saturday, December 21, 2013 Today, Members from Boothwyn and Ogden escorted Santa and His Elves around Upper Chichester spreading holiday cheer throughout the Community. We hope that everyone had a chance to see Santa. He apologizes if he might of missed anyone. Rest assure, he said he would make a return appearance again next year. Thank you to all of the members who came out to assist Santa this year. Your help is greatly appreciated! 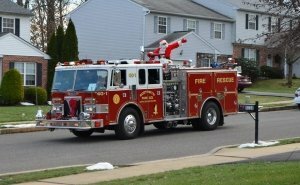 Pictures courtesy of Fire Ground Photography! Friday, December 20, 2013 Around 3 p.m, the Rescue and EMS were dispatched to the area of Conchester Highway and Dutton Street for an Accident with Injuries. The correct location ended up being on the on-ramp to 322 WB from 452. Rescue 40 and 40-7A arrived on the scene within minutes. The crew from Rescue 40 had to extricate one subject do to being pinned in by the door. The crew removed the drivers side door and the EMS crew was able to tend to the patient. The Company cleared the incident in a half hour. Picture courtesy of Rich Lynch. Thursday, December 19, 2013 Around 4:30 a.m, The Company was alerted to Artwin Road in Talleyville’s district to assist on a Working Residential Fire. The Rescue marked up with 8 members shortly after dispatch. Units from Talleyville, Claymont, and Brandywine Hundred were operating on the scene and located a victim during the primary search. The victim was pronounced on scene by NCC EMS. Our thoughts and prayers go out to the victims family. Boothwyn/Ogden crews were assigned the RIT duties on their arrival. Crews set up on side A. No services were needed and the Company cleared in about two hours. Units operated under the Command of Talleyville Chief Tom Looney. Thank you to Squad 50(Middletown) for covering our local.